Hampshire College is a winner of a major award to encourage college and university campuses in the region to work together to increase the amount of regionally-produced food on campus menus, it was announced by the Henry P. Kendall Foundation. This year, the Foundation challenged the region’s 200+ college and university campuses to submit bold, collaborative ideas for consideration. Hampshire and its partner colleges submitted one of five winning ideas. Hampshire and project partners Smith College, Westfield State University, and Mount Holyoke College will work with The Hotchkiss School, Whippoorwill Farm, and Adams Farm to support farmers in the region to adjust their production and delivery to meet demand and enable the institutions to process and store beef and pork more effectively. Andrew Fleischer of Bon Appétit, the management company for Hampshire’s dining services, said Hampshire has been making progress the past five years in increasing the amount of dining commons food from local farms and sources, to roughly 40% this year. He explains that this Kendall grant will help Hampshire and its project partners better manage local livestock from the Hampshire College Farm and other local farms, including storage and distribution of beef and pork. Bon Appetit Management Company is an on-site restaurant company that offers food-service management to colleges and other institutions and operates more than 1,000 cafés in 33 states. For more than 60 years, the H.P. Kendall Foundation has supported visionary projects and leaders, said Foundation Executive Director Andrew Kendall, adding, “The ideas represented by this round’s winners reflect the kind of ingenuity we need to build a healthier, more sustainable food system in our region." 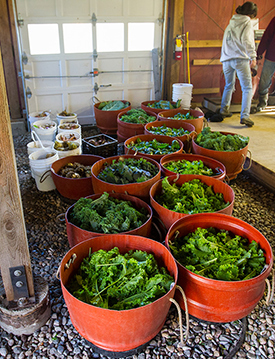 Founded in the early 1970s for faculty research, the Hampshire College Farm expanded its mission in 1992 to include sustainable production of food and has become one of the most successful educational farms at a liberal arts college. Every fall, the farm is busy with student workers, caring for livestock and harvesting rows of vegetables to generate produce for the weekly CSA (Community Supported Agriculture) distribution. Hampshire’s Farm was one of the first farms to pioneer the CSA model that would transform the food landscape around the country. provides food to hundreds of CSA shareholders including the campus dining commons and cafés. The New England Food Vision Prize is designed to accelerate progress towards the New England Food Vision, a regional goal to produce at least 50% of New England’s own food by 2060, while supporting healthy food for all, sustainable farming and fishing, and creating thriving communities. One strategy to accelerate the region towards this goal is to unlock the market power of large food purchasers, like colleges and universities. The Prize is designed to support ideas that result in higher procurement of regional food by institutions, more regional food on campus menus, and increased demand for regional food by students and alumni. For this year award, campus food service directors were eligible to submit ideas for consideration. To qualify, ideas had to meet five areas of criteria: Collaborative, Replicable, Sustainable, Measurable , and Movement-building. The Henry P. Kendall Foundation is a New England philanthropic enterprise that is part of a strong and rapidly expanding network aiming to create a resilient and healthy New England food system. Massachusetts Maritime Academy, University of Massachusetts Dartmouth, Northeastern University, and Eastern Connecticut State University, working with Chartwells, Farm Fresh Rhode Island, Sardilli Produce, and Dole & Bailey. For more details on the 2018 Prize winners, please visit kendall.org/prize.